Portuguese police faced growing pressure to reopen the Madeleine McCann investigation yesterday, amid claims they ignored potential sightings of the missing girl. Detectives have refused to investigate hundreds of clues about the disappearance, including photographs of children said to bear a 'shocking' resemblance to the blonde youngster. They include a cluster of sightings in Italy and Spain which could hold the key to solving the mystery and ending the years of heartache suffered by her parents, Kate and Gerry McCann. But instead they have gone unchecked, marked as 'irrelevant' after the case was shelved, and left to gather dust in a police archive. 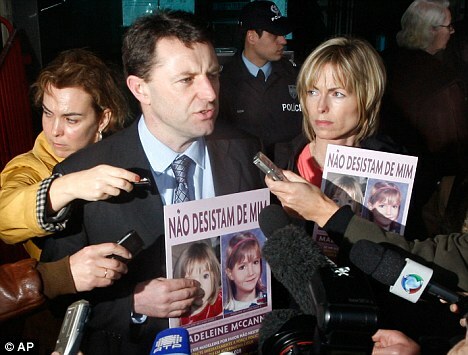 The McCanns' private detectives, who are continuing the search for the missing child, did not even know the dossier existed until a Portuguese policeman let slip a reference to it during a legal hearing. Inspector Ricardo Paiva said police had received hundreds of tip-offs from witnesses convinced they had seen Madeleine and knew where she was being held. They sent in photographs of children and of locations which they believed were being used by her abductor, believing that police would investigate their claims. But arrogant detectives were so convinced by their own theory that Madeleine died on the night she disappeared, and that her parents faked her abduction, that they made no attempt to check the sightings. She said: 'I was shocked at how much was in there, and that absolutely nothing had been done to follow any of it up. 'Every piece of information was treated the same way - Ricardo Paiva writes on it "This is not relevant to the investigation". Mr Paiva gave evidence at a legal hearing over a controversial book, written by his former boss, Goncalo Amaral. He admitted that Mr Amaral's insistence that Madeleine died on May 3, 2007, meant the police investigation had failed to consider other options. Mrs Duarte said they had not investigated any tip-offs since the case was officially shelved, in July 2008, when the McCanns were cleared as official suspects in the investigation. She said information had continued to pour in from potential witnesses and even from other police forces in Europe, but was ignored, even when the clues including photographs of girls who looked like Madeleine. The lawyer said: 'Some of them are very, very similar to Madeleine. But Kate and Gerry had never been shown them. 'There was information from Leicestershire Police, French police, Spanish police, and again nothing was done about it. 'Kate and Gerry did not even know this file existed until this week. I am going to give a copy of the file to them so that their private investigation team can follow up the information in it. 'But I am angry because it is the Portuguese investigative police who should be doing this job. Mr and Mrs McCann, both 41, will discover next week if they have won their court bid to keep an injunction which bans Mr Amaral from repeating his vile claims that their daughter died in a 'tragic accident' and that they faked her abduction to cover up the death. Their spokesman Clarence Mitchell said they had been shocked to discover the full extent of the Portuguese police's failure to investigate Madeleine's disappearance. He said it had confirmed their worst fears about the investigation, saying: 'They were shocked when they went through the file and saw what was in it, and even worse what little had been done to follow any of it up. 'Kate and Gerry have consistently known that potential fresh information was not being properly followed up, if at all. 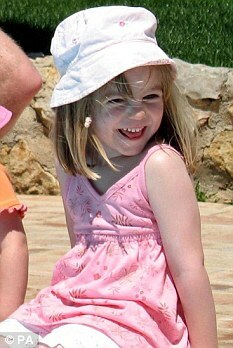 'The tragedy of this case, which once again has been highlighted by this, is what little was done to find Madeleine.